Student life can be stressful; you’re adapting to a new place, new people and new accommodation. All of this can be exciting and enjoyable, however it can also be difficult and challenging. Even if you find the switch to uni life easy, you might find there comes a point when you find that you aren’t coping with something as well as you thought you would do. It’s okay, to not be okay. You are not alone. Just like physical health, we all have mental health, and this can vary from time-to time. We want everyone to love their time at Brookes. Sometimes you need a little support. Take time out to relax. Getting away from your desk for a bit can help keep you calm. Try and get some fresh air where you can. Keeping active can improve your mental health. This could be yoga, dance or anything that you enjoy. Improving your diet can lead to a more positive mood, clearer thinking and more energy. Limit your caffeine intake, drink plenty of water and eat five portions of fruit and veg a day. Getting into a regular sleep routine can improve your mental health. Find out more from NHS Choices. 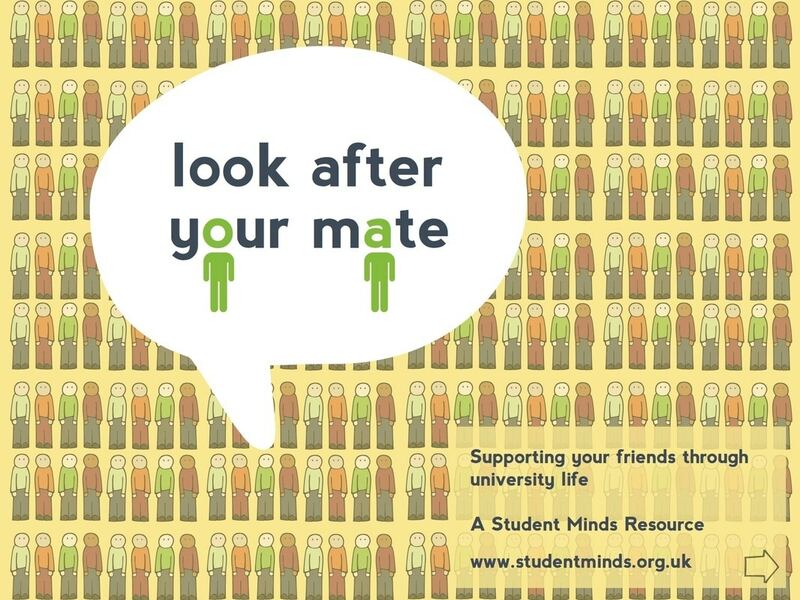 As part of the ‘Look After Your Mate’ campaign, Student Minds produced a Guide for Friends. Take a look at the guide for tips on starting a conversation with a friend, keeping the conversation going, understanding your friends diagnosis and much more! This guide, which is shaped by students’ own experiences, will support you to look out for your mates, from starting a conversation to navigating the student journey. There are lots of places to find support at Brookes. Just telling someone - a friend, a GP, a member of staff - how you are feeling can bring you a sense of relief. The student-led group Student Minds run a Positive Minds course, which looks at equipping students to deal with low mood and depression. If you have, or develop, a mental health condition that requires treatment, it's important to arrange continuity of care between your university doctor and your family GP.